These are the ultimate pancakes and likely destined to become your new favourite! They’re cakey, fluffy, moist and are a great way to sneak veggies into the kids. I’m not sure why but I’m not a pancakes- for- breakfast kinda girl. We generally make these for supper, add a smoothie and we’re set! This will make about 10 medium sized pancakes so if you’re cooking for a crowd, double/ triple / quadruple the recipe as needed. Add your ground flax to a bowl and add your favourite non dairy milk. Beat with a fork for about a minute and then add the vinegar, water, maple syrup, oil and vanilla. Mix well. Sift flours, baking powder, salt, cinnamon, ginger, nutmeg and allspice into a large bowl. Add the wet ingredients and mix until just combined. Fold in the grated carrot and walnuts. Preheat a cast iron skillet over medium low and spray the pan with oil. Add the batter in 1/3 cup scoops. This is key to ensure the batter cooks through properly. Cook one pancake and if you’d like it thinner, add a bit of water. You may have to do this a couple of times as the batter sits and thickens. Cook for about 4 minutes, flip and cook the other side for another 4. Serve with maple syrup. Delicious!! Adapted from Moskowitz, Isa. “Carrot Cake Pancakes”. Isa Does It . 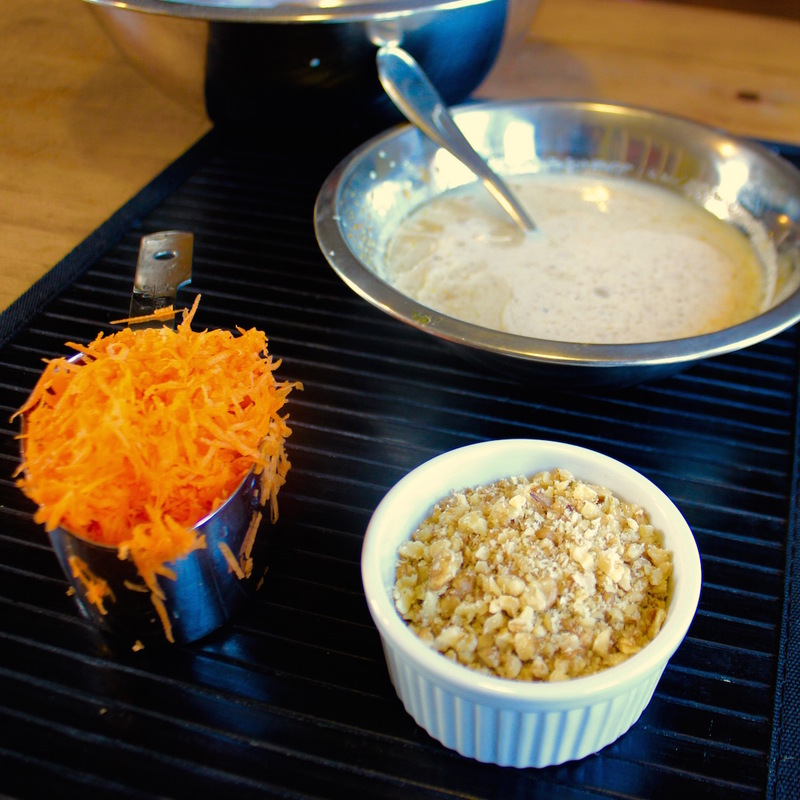 Delicious, perfectly spiced carrot pancakes that are sure to become a favourite! Adapted From: Moskowitz, Isa. 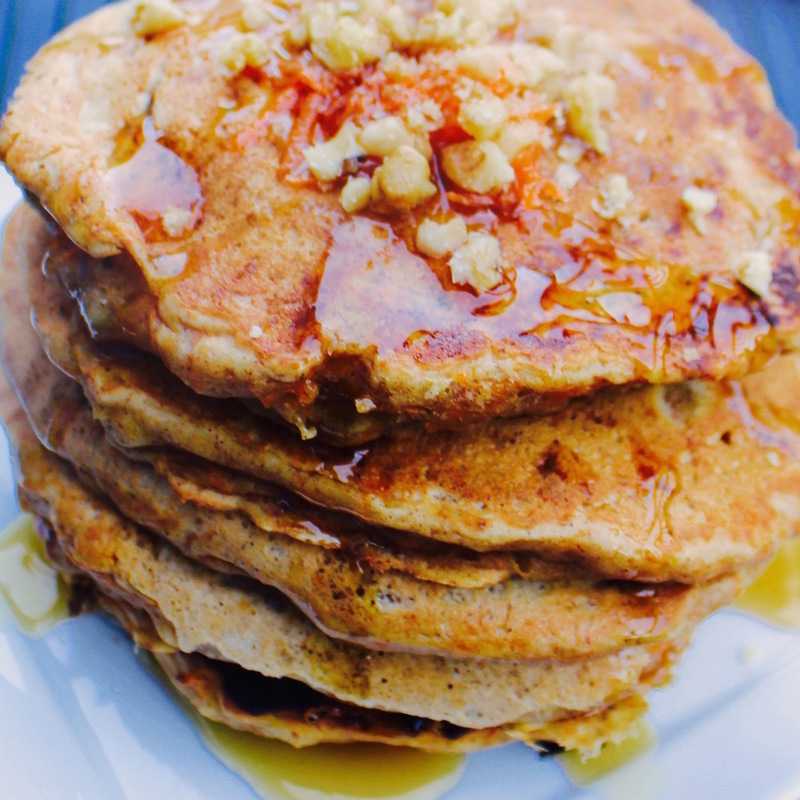 "Carrot Cake Pancakes". Isa Does It. Add your ground flax to a bowl and add your favourite non dairy milk. Beat with a fork for about a minute and then add the vinegar, water, maple syrup, oil and vanilla. Sift flours, baking powder, salt, cinnamon, ginger, nutmeg and allspice into a large bowl. Preheat a cast iron skillet over medium low and spray the pan lightly with oil. Add the batter in ⅓ cup scoops. This is key to ensure the batter cooks through properly. Cook one pancake and if you'd like it thinner, add a bit of water. Cook for about 4 minutes, flip and cook the other side for another 4. Do you think this would work without the oil? I’m sure this will be a great hit with all “Pancake Lovers” everywhere!! !